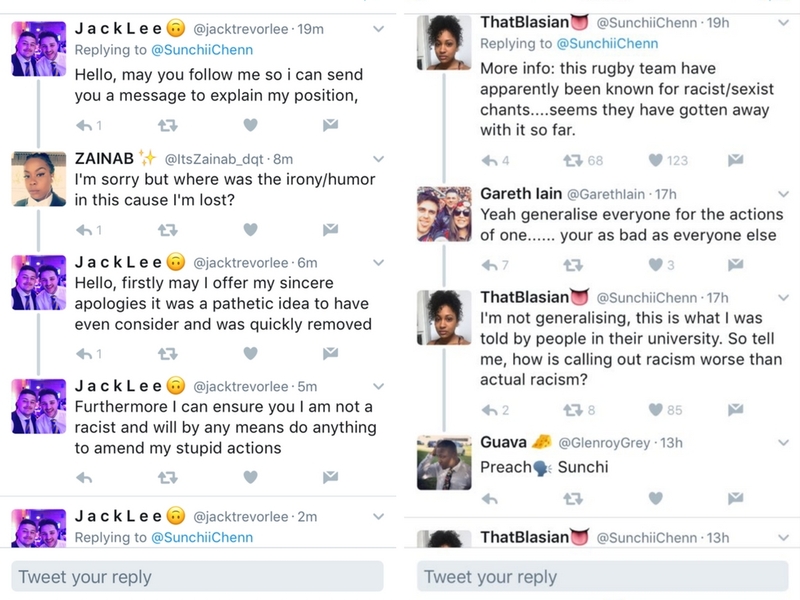 This weekend a photo surfaced of a rugby player at Anglia Ruskin university, Jack Trevor Lee, donning blackface as part of his Serena Williams costume at a Rugby Team event. He had brazenly snap-chatted his face, leading to an acquaintance taking a screen shot. At the time of writing, the screen shot has now been retweeted nearly 4000 times. On seeing the image, I felt completely drained. I had spent my day at the Black Women’s Conference in London celebrating the often over looked achievements of peers. I had bonded, laughed and shared stories with women I had only met a few hours ago. Yet this one image managed to reduce me to tears within a few minutes. Why is it that there is still a blatant disregard for black women’s bodies? That we are still the subject of supposedly “hilarious” costumes at sports nights or Halloween? Blackface is one of the few forms of racism that leads to collective outrage from the black community. The act of “blacking up” is rooted in the caricatures of black people during minstrel shows which were popularised throughout the 19th century – permitting the black body to be mocked. IT is inherently racist – derived from the idea that black skin is to be mocked and belittled. Every time we feel that the practice has been consigned to the history books, it re-emerges in the most unlikely of places – a university event, at an institution of supposed learning and enlightenment. The young man at the centre of this incident felt that the act of blackface was acceptable enough for him to wear his outfit publicly. In subsequent tweets he denied being a racist and issued an apology. But it is deeply concerning that there are social spaces that exist which permit this behaviour. Any such venue is declaring that the comfort of black people is of no interest. There may as well be a sign stating “No Blacks” at the door of these establishments. Even more concerning is how some of Jack’s rugby mates were willing to defend his actions over Twitter. 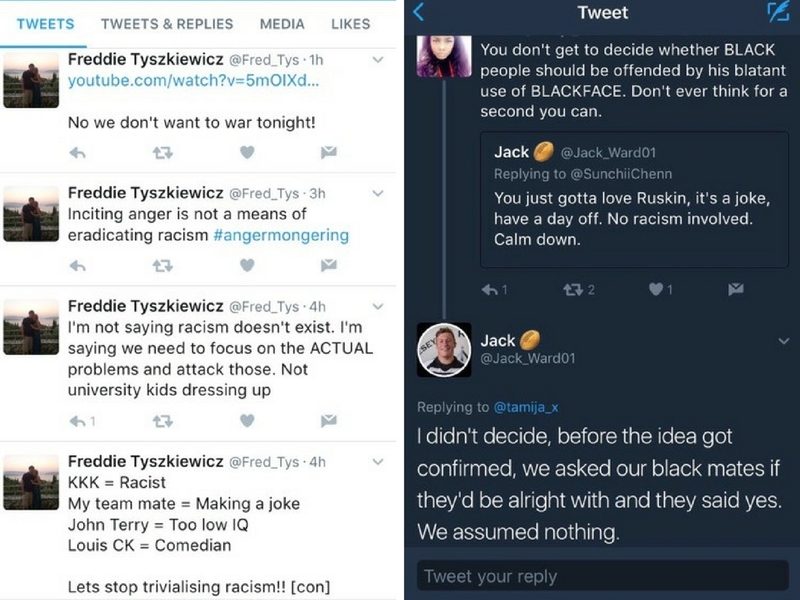 These tweets have subsequently been deleted, but if this was not enough, the woman who uploaded the picture has now been subject to harassment by several people – many of whom have demonstrated a complete lack of understanding as to why blackface can never be the same as “another fancy dress costume”, as one Twitter user stated. Was it a pure coincidence that the celebrity mocked was Serena Williams? Williams has spent much of her career being derided for her “masculine” body shape by the mainstream press. The vitriol towards Serena escalated when she announced that she would be expecting her first child with her white partner – Alexis Ohanian – the co-founder of Reddit. This has been the treatment of arguably the greatest sports player of all time. We now arrive at a situation where a young, white man feels emboldened to use her as a disposable costume, including full blackface. We must continue to tackle the institutional racism that prevails reducing black bodies to “fancy dress” and blackface. Continuing to explore what can be learnt from movements such as Why is my curriculum so white? and Rhodes Must Fall. Anglia Ruskin Press Office state that “Anglia Ruskin does not condone or tolerate any form of racism and we are investigating this incident”. However it is no longer enough to claim that racism is “not condoned or tolerated”. Active steps must be taken to diversify the student curriculum and foster cultural understanding. I dream that no child of mine should ever have to explain why they feel demeaned by blackface.